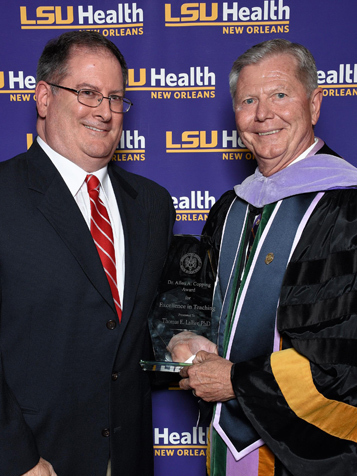 ﻿Along with the other five schools of LSU Health New Orleans, LSUSD held its annual commencement on Thursday, May 17, 2018, at the UNO Lakefront Arena. Dr. Rebekah Gee, secretary of the Louisiana Department of Health, delivered the commencement address. 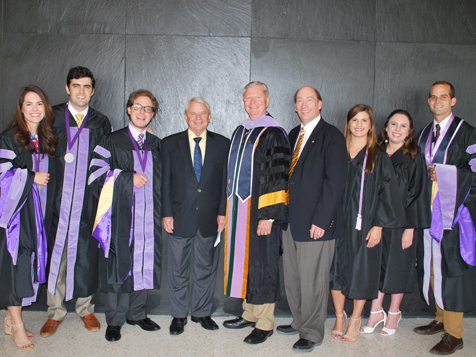 At this 47th commencement of the Dental School, 63 students received the doctor of dental surgery, 37 received bachelors of science in dental hygiene, and two received the associate degree in dental laboratory technology (DLT). Top students from each program received Chancellor’s and Dean’s Awards. Chancellor’s Award recipients were Jonathan Doucet (Dentistry), Caitlin Domingues (Dental Hygiene), and Lillie Bourgeois (DLT). Recipients of the Dean’s Award were Hannah Knott (Dentistry), Sidney White (Dental Hygiene), and Anthony DiVincenti, IV (DLT). ﻿﻿Alumni Association Leadership Award winners (l-r) Erin Moore, Trace Favre, Eddie Starr, Chancellor Larry Hollier, Dean Henry Gremillion, Alumni Association President Ike House, Sarah Bourgeois (DH), Lillie Bourgeois (DLT), Jonathan Doucet. Each year at graduation, deserving faculty members from each school of the health sciences center receive the Allen A. Copping Excellence in Teaching Award. Mark Winkler, DDS, MS, PhD, associate professor, comprehensive dentistry and biomaterials, is the 2018 Dental School recipient. A graduate of the LSUSD class of 1981, Dr. Winkler received his MS and PhD in biological materials at Northwestern University. ﻿After teaching at LSUSD for five years, he joined the Indiana University School of Dentistry Department of Dental Materials in 1992. Since returning to LSUSD in 1998, Dr. Winkler has served as director of numerous courses in operative dentistry and dental materials. He has many publications in research and dental journals. Among his contributions to the improved teaching of dentistry are “The Wrinkler,” a device he created to assist students in pouring up impressions for full dentures, an improved project book, and over 16 hours of digital videos for operative dentistry courses. Thomas Lallier, PhD, professor of cell biology and anatomy and member of the Center for Excellence in Oral and Craniofacial Biology, received the 2018 Copping Award for the Basic Sciences. A graduate of the University of Virginia, Dr. Lallier received his PhD in developmental and cell biology from the University of California, Irvine, where he also completed a post-doctoral fellowship. He then returned to the University of Virginia in the position of research associate in the Department of Cell Biology. 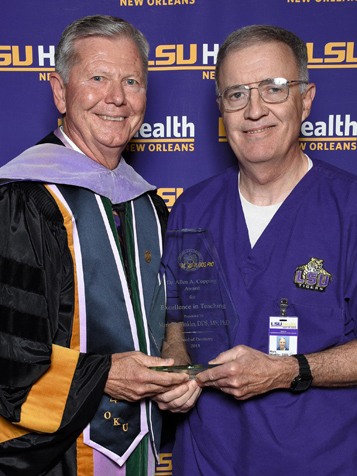 A member of the LSUHSC Department of Cell Biology and Anatomy since 1997, he is based at the dental school. Teaching in both the medical and dental schools, Dr. Lalier's primary responsibility has been for dentistry. He is director of the histology courses for dental and dental hygiene students as well as past course director for a core Graduate School Interdisciplinary course. In addition to his research and numerous publications, Dr. Lallier has focused on mentoring dental student researchers. He is an active member of the Dental Grand Rounds course, the Curriculum Committee, and the Teaching Academy. Each class honors faculty members for excellence in teaching with Golden Apple Awards. During the Recognition Ceremony held on May 16, graduating classes presented awards to Suleiman Hamdan, BS, CDT, associate professor of prosthodontics, for dentistry; Heather Allen, RDH, MSHCM, assistant clinical professor, for dental hygiene; and David Vela, associate professor of prosthodontics, for dental laboratory technology. The remaining three dental classes presented teaching awards during class sessions to Adriana Wilson, DDS, MSD, clinical assistant professor of prosthodontics (D3); Kavas Thunthy, BDS, MS, MEd, professor of diagnostic sciences (D2); and Dr. Mark Winkler (D1).